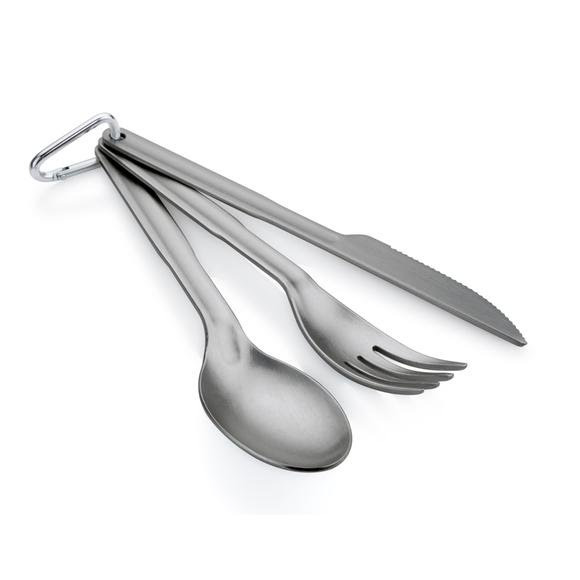 The GSI Halulite 3 piece Ring Cutlery set is made from a proprietary, ultralight aluminum alloy that's both strong and light. GSI Outdoors has included a carabiner clip that keeps everything together and helps to avoid those infamous backcountry disappearing acts. The GSI Halulite 3 piece Ring Cutlery set is made from a proprietary, ultralight aluminum alloy that&apos;s both strong and light. GSI Outdoors has included a carabiner clip that keeps everything together and helps to avoid those infamous backcountry disappearing acts. The ultimate lightweight, technical ring cutlery set. Made of durable, proprietary, ultralight alloy.